Wow! The new church year has started and there has been a flurry of activity in the past few weeks regarding the work Jena Roy called on us to begin last spring. We will keep you informed with Spire articles, notes in the Church’s weekly email and active participation events. We want everyone to feel the excitement and spirit of this endeavor. The Leadership Team has formally charged a working group to manage this initiative. Its members are Bruce Alexander, Laurie Roby, Carolyn Plosky, Rev. Will Burhans, Rev. Judy Arnold, and Jane Ring Frank. We will be looking to augment our group as this work proceeds. We plan to be an active and communicative group—don’t hesitate to reach out to any of us to share your ideas and ask about latest developments. One thing our working group is focused on: We want to think about these renovations/restorations not as ends in themselves but rather as ways to live into the Church’s Purpose. Making improvements only matter if we use these improvements to be even more of a Christ-centered, nurturing community, growing in faith, serving in love and welcoming all with joy. We will need your help to achieve that. Our Fisk organ, Opus 50—just a few years short of its 50th birthday—was installed in our sanctuary in the spring of 1969. 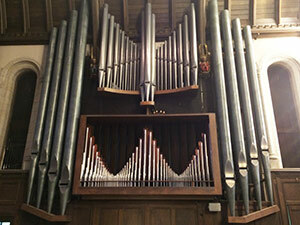 As many of you know, the organ is in need of serious love and repair. Jena Roy’s vision for our future, coupled with her unflinching faith in a loving and creative God, includes seed money that has allowed us to dream—pursuing the possibility of a major organ renovation. In assessing the organ’s needs and with C. B. Fisk’s expert advice, we have come to understand the necessity, not only for a technical renovation, but for a long-term maintenance fund that will allow us (and generations to come) to thoughtfully care for the instrument. We have experienced a stunning confluence of events over the summer: a few early and generous donors have allowed us to enter into serious talks with Steve Dieck, Chairman of the Board and past President of C. B. Fisk, Inc. Steve apprenticed for ten years with Charles Fisk (beginning in the early 1970’s), before moving into the ranks of the company. He just retired, as of September 1, from his post as President—but with one exception: his last project, before fully retiring from Fisk, is to oversee our organ renovation! These early donations, thoughtfully and movingly given in Jena’s memory, have come to us before any formal fundraising has begun. As a result, it is our plan to enter into an agreement with C. B. Fisk, scheduling the renovation of the organ for late winter, 2017. Steve has assured us, as best he can and barring no unforeseen problems, that the work will be completed by Easter of next year. What does this require? The project estimates have come in, and we know that the renovation will cost $130,000. We have calculated an additional fundraising goal of $60,000, money that will generate yearly income and guarantee a well-considered maintenance plan. The overall project fundraising goal is $190,000. In order to secure the services of C. B. Fisk, we will need to enter into an agreement with the company. This agreement, along with a deposit of one-third of the cost of the project, will allow Fisk to commit to us and firmly place us in their complex work schedule. The actual work on the instrument should take 4-6 weeks, beginning some time in February, 2017. And yes, the instrument will be out of commission for a part of that time. Before the work begins, we intend to bring the project before the congregation for a vote of approval. It is a testament to Jeffrey’s singular talent that he continues to share his artistry with us, despite the organ’s limitations. He possesses the knowledge and instinct to finesse and trick this ailing instrument into producing inspiring and stirring sounds. But we thought it was time for you to hear a few of the problems that have worsened over the last ten years. On Sunday, October 2, immediately following the worship service, we invite you to come up to the chancel, up close and personal—to meet with Jeffrey and to hear a few of the whines and groans that Jeffrey so cleverly disguises. Let everything that breathes praise the Lord! As you may have noticed or heard, the pews in Ripley Chapel have been moved to the back. In September and October there will be a number of opportunities for members of all ages to participate in thinking about this underused space and how we might change it while still retaining the beauty of a sacred room. You will find posters near and within the Chapel (thanks, Anne Hoenicke) that display some of the history of the Chapel. And there is a flip chart that can be used to write down your ideas, either during organized meetings or when you happen to wander in and the spirit moves you. Already the children kicked off their conversation when Stepping Stones, on Sunday, September 18 were asked what they might want to see in a new Ripley Chapel. Forum youth will also be given a chance to do this. And for everyone we have had two sessions, on September 25 and October 6. Should there be future session, it will be announced in the weekly email. Meanwhile we have engaged Torrey Architectural to conduct a Schematic Study Design. David Torrey performed work for the church back in 2006-2010 when we created a master plan and made major capital improvements. Ideas for changes to Ripley Chapel were generated then and have continued to be germinating amongst church members over the years. Those ideas have been shared with David and will inform his work. There will be some cross-fertilization as our conversations proceed and David does his creative and technical work. You may see activity during October as the work proceeds. At the end of this phase there will be a convergence of all ideas and a congregational process to study, discuss and make decisions as to how to proceed and what financial resources we believe can be raised. We expect this will begin in December. Depending on what we decide, a Phase 2 of this project would be Design Development that would generate construction ready drawings and a final cost analysis of the project. Phase 3 would be the actual construction work. We sense a great deal of excitement about all of these efforts and we hope you feel it too. So many generous gifts have swelled the Jena Roy Fund to over $280,000 and more will be needed. Wow!, indeed.